No one should have struggle with teeth that are suffering from injury or decay. Sadly, though, that’s what many adults do for days on end when they just can’t find time in their busy schedules to accommodate the multiple appointments necessary for crowns and other restorative procedures. At Aspen Dental Care in Ft. Collins, CO, we want to make this process simpler and more accessible for patients. That’s why Dr. Shiloh Lindsey is happy to offer same-day crowns with the revolutionary power of E4D. 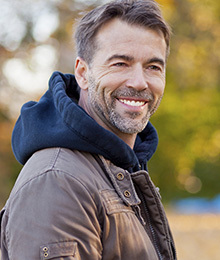 This alternative to traditional dental restorations allows us to create and place the high-quality crown you deserve over the course of a single appointment. Your new, personalized crown will be both designed and created with the help of advanced computerized systems. Our team will first create digital impressions of the tooth in question, which the E4D machine will use to develop a structure that precisely fits your tooth. This important information is then sent to the milling unit, which will transform a porcelain block into your beautiful, natural-looking restoration. No temporaries are required – you’ll leave the very same day with a permanent, securely-placed crown you can feel proud of! Repairing a tooth that’s been significantly damaged or injured. Restoring areas that are severely decayed. Protecting a tooth that has been treated with root canal therapy. Enhancing the cosmetic quality of a certain tooth. Are you ready to finally experience a happier, healthier smile! Please don’t hesitate to contact our Ft. Collins, CO dental office today to schedule an appointment! Dr. Lindsey and her team are happy to welcome families and patients of all ages to experience our friendly, comprehensive approach to dental care firsthand.